I’ve recently recieved emails and answered questions to my peers and readers who are curious about their naturality. I am delighted that you guys would look to me for advice and opinions for I’m still on my journey but I don’t mind taking you guys along for the ride. I am currently in the process of writing my “Hair Story” for http://www.going-natural.com and as I tell my story over and over to writers, websites, and you guys, this will be a liberating experience for your mind, body, and soul. 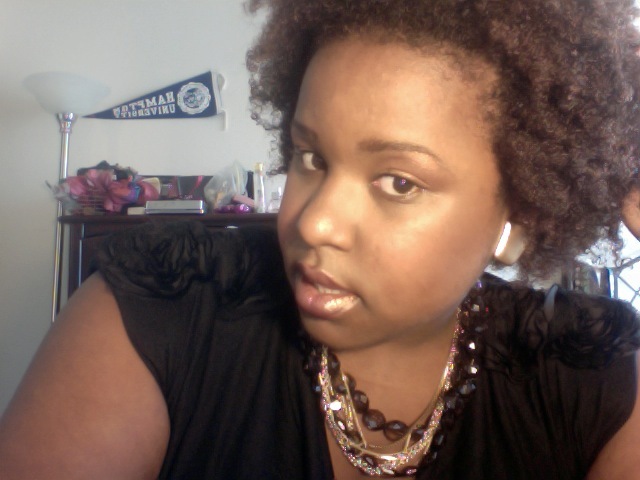 If you are afraid of wearing your hair at it’s natural state, I suggest that you transition. To me, depending on how damaged or processed you hair has been transistioning can be very hard. You may decided to stop the perm and just wear weaves or braids or even a wig but make sure that once you stop that creamy crack that doesn’t mean you do nothing to your hair. My opinion is that if you are willing to learn how to care for you hair then I’d suggest you go forth with the transistion. The Big Chop. That’s how I started my journey, as I told you before in my testimonies I wasn’t given a choice and because my hair was so damaged I had to remove the broken hair which left me with 2 inches of new growth. Yeah, I had to grow up fast, but I am thankful for it because I was put out there like a fish in the sea and immediately fell in love with my naturality. So if you are thinking about going Natural, the one thing that you have to build is confidence and acceptance of oneself. You may not have it now but once you transition to this side you will learn all of these characteristics. But the cool this is, you will not be ALONE. Our community is big and rapidly growing. This journey will teach you to love every part of your body at its natural state and will give you hollistic reasons to want to take care of your mind, body, and soul naturally. And so, I open this forum up for you guys to share you thoughts, concerns and advice in the “Natural” Community! Positivity! Post your comments below! Tell your friends! Anyone who is interested to hit me up!